Time is as valuable as irretrievable. Since you know that, and you’re going on a quick trip to Cancun, we want to help you with the best activities for the short time you’re staying in this destination! Here are some categories to enjoy the best of your short vacations in what you like to do! If shopping is your thing and you want to buy some new clothes, swimsuits, shoes or accessories, Cancun is the perfect place for that. This city has an innumerable amount of stores for everyone, including amazing malls, like La Isla Shopping Village where you will also enjoy the best view of the Nichpté Lagoon. If this is not enough, you can enjoy a swim with dolphins before or after shopping in this amazing mall. Discover more about the experience! Now that you have your swimsuit, it’s time to choose between the best aquatic and eco-archaeological parks in the Mexican Caribbean: Xcaret and Xel-Há. If you have more than two days, you could consider spending a day in one of them to swim in underground rivers, try some adventurous activities or swim with dolphins in Cancun there. The best part is that you can get an all-inclusive package for each of them, so you only have to make a choice! Learn more about the all-inclusive package for Xcaret. Learn more about the all-inclusive package for Xel-Há. Discover the best of ecotourism in one of the most beautiful beaches in the area. Located only 36 km away from Cancun, Puerto Morelos is your best option. This is a fisher’s town where you can find part of the second biggest coral reef in the world. Snorkeling and diving are a must in this place! Besides, Puerto Morelos is a really quiet place, where you’ll be in direct contact with nature, thanks to the conservation areas of the zone. And you can also swim with dolphins here, but in an amazing natural habitat! Tulum: even if this means going 2 hours away from Cancun, it’s completely worth it! You will be in front of one of the most beautiful Mayan temples with a spectacular beach on its feet! Chichen Itzá: this is also a must. The magical and emblematic ruin is also 2 hours away from Cancun and it was declared World Heritage Site by UNESCO and it’s known as one of the 7 wonders of the modern world. Cobá: Cobá is also a very important ancient city. It’s located a bit further than the others, but this is a good option to complete your archaeological tour. Even on a quick trip, you have a lot of options to enjoy Cancun! Find more options for a weekend in Cancun, and plan them all with anticipation. 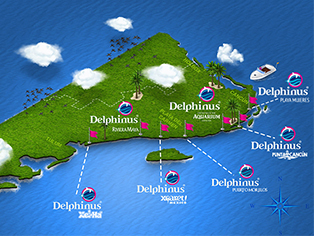 If you want to experience a swim with dolphins, discover which types are available and select one of them!